JaM Patch News ---- In the Pink!!!!! The kits for the last months are ready for pick-up/shipping. Yes, the fabric will soon be in your possession to complete the top. They have been working hard and the blocks are looking beautiful. What a fabulous quilt!! 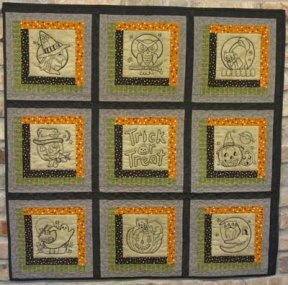 If any of you are interested in having this quilt for your very own, we do have one or two kits available with the fabric or you can chose your own fabric and just purchase the patterns. Here is what it looks like. This Friday and Saturday are when the group meets. A regular meeting will be held on Friday but because of a Pink Tie commitment for Saturday, we will not have a regular meeting. You are welcome to stop by and pick-up your third trimester patterns; and if you haven't, your fabric and your August newsletter. It is just your border print. Saturday, the classroom, will be open if you would like to sew. Anyone who is a Saturday girl is welcome to come to class on Friday. We will share a peak at 2011 Club's quilt. Here is the project they have been working on. In celebration of our Pink Tie Friends, we are offering all pink fabric at $5.00 a yard. Any "mostly" pink fabric is $5.00 a yard with a minimum one yard purchase. Or as we say if you look at the fabric and say "PINK," it is on sale. The sale will be taking place until close of business on Saturday, August 21st. So come and get "In the Pink." 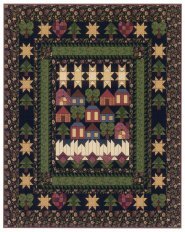 We are offering to you, our quilting friends, the use of our classroom when a class is not scheduled. 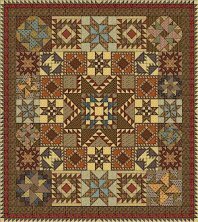 There is a charge of $10.00 and we are available to assist you in a problem quilt, etc. It is wonderfully air-conditioned and there is always a fun group over there working. This week we have time available on Tuesday, August 17th and Thursday, August 19th. Remember on the 18th, Wednesday, both Martin County Quilters and Thimblebuddies will be using the room for charity and raffle quilts. The cutest patterns have arrived here from Buttermilk Basin. 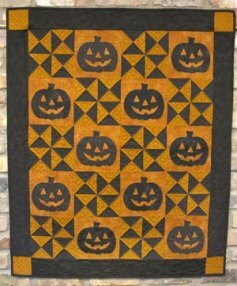 They are Halloween stitching project and small wall hangings. They are so cute. I can't wait to start doing one. The fabric continues to come in and we have some real neat fabric arriving this week. We have received in many new books and patterns. We are working on our Class Schedule for the remainder of the year. Both Joey and Margy are teaching some store Favorites as well as some new projects. The gals are also working on some goodies for you. Is there anything you would like us to schedule for you and some friends? Drop us an e-mail and let us know.